I nearly fell over when I saw this. My friend Russell James pointed it out to me. I’m on a list of books that Yoko recommends! Yoko is known world over for being the wife of John Lennon and for being an artist and a peace campaigner. I mean, I just love her. I just LOVE HER! I may never get over this moment. 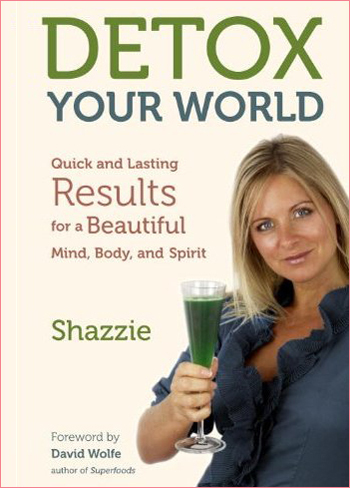 And here is the book she’s recommending: Detox Your World, published in the UK by my company Rawcreation Ltd, and in the USA (in the summer) by North Atlantic books. The USA copy has been rewritten for the USA market. Both copies are up to date with information, so if you are from the UK, please buy the UK one. The USA one is full of American statistics and measurements in the raw food and detox recipes. What is Detox Your World? Imagine a transformation so profound it changes your whole world. Detox Your World is 382 pages, with over 100 unique raw food recipes, to make your detox time interesting, tasty and fun. Be inspired by the testimonials — real life people writing honestly how they lost weight, lost their illnesses whilst gaining confidence, direction and joy in their lives. Delight in the Detox Helpers chapter — many luxurious ways of making your detox quite heavenly. There are also details on emotional detox techniques such as vipassana, laughing, and a secret set of exercises practiced by Tibetan monks! I just want to give a huge big thank you to Yoko for recommending this book to her audience. And I couldn’t finish the post without this, could I? i’m sooooooo Happy and Excited for U! Wow, that is sooooo good! And I love that song.